This is not your grandfather's beer, although it could be. This month's release of Lompoc Brewing's "Top Shelf, Old Sport" Belgian-style dubbel will evoke Victorian-era aristocracy with strong notes of caramel, raisins, prunes, dates and oak. Aged for eight months in Maryhill Winery cabernet sauvignon barrels, the dark brown ale is served in a snifter — one of dozens of delightfully complex and robust beers brewed exclusively for this year's Holiday Ale Festival. The 22nd annual event — the Northwest's only outdoor winter beer festival — runs Wednesday through Sunday, Nov. 29-Dec. 3, under clear-topped, heated tents at Pioneer Courthouse Square. It will feature 55 specialty and rare craft beers, ciders and meads in the main lineup that will be tapped, all of which are made or blended specifically for the event. In addition, attendees can meet the brewers, enjoy beer-cheese pairings and food from local vendors, and snap silly shots in a holiday photo booth. An elaborate scaffolding design creates a second-level Sky Bar, which adds to the ambience and eases the crowding; more than 14,000 people attended the five-day festival last year. This Imperial cider may look sweet on the outside, but packs a punch at 11 percent alcohol-by-volume. It's fermented with dark Meadowfoam honey and aged in bourbon barrels with whole nutmeg, clove and cinnamon sticks for 12 months. Winter spices mingle with the wood and sweet bourbon aromas that may just make draw a few new cider fans. • Restoration Bock, by 54º40' Brewing Co. This German-style dopplebock was created in collaboration with the Columbia Gorge Refuge Stewards to raise awareness of the preservation and restoration efforts for native species at Steigerwald Lake National Wildlife Refuge, next door to the brewery in Washougal, Washington. The bock drinks smooth with a rich and warming sweetness and a toffee-like finish. In the category of "goes well with tacos," this smooth stout features cinnamon, vanilla bean, nutmeg and lactose sugar to balance and spice the roast and chocolate malts from a classic oatmeal stout recipe. This semi-dry, unfiltered Honeycrisp cider uses Northwest-grown apples, freshly pressed and fermented with Belgian wit ale yeast. It's then blended with Newtown Pippin juice and finished with winter spices including cinnamon, clove and coriander. Enjoy the sweet-tart balance, and notes of banana. • Barrel Aged Imperial S'more Stout, by Base Camp Brewing Co. Sounds like a match made in heaven: s'mores, stout and bourbon. Base Camp kicked up their S'more Stout with a stint in their bourbon barels to add notes of vanilla, oak and dark sugar — perfect for your next bonfire on the Oregon coast. 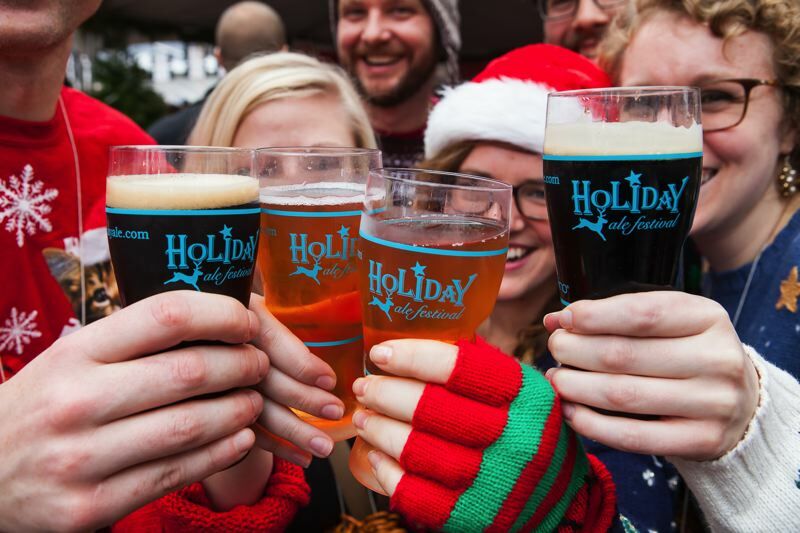 Check it out: Holiday Ale Festival, 11 a.m.-9:30 p.m. Wednesday through Saturday, Nov. 29-Dec. 2, and 11 a.m.-5 p.m. Sunday, Dec. 3, Pioneer Courthouse Square, advance $35 (including a taster glass and 14 tickets), tickets also available for VIP packages, day-of purchase and designated drivers, www.holidayale.com.